I have the USBtinyISP kit from adafruit.com and I blew the 74AHC125 IC when I was working late at night and accidentally connected VCC (or perhaps RESET) with 12V VIN. Oops. I checked my cabinet for a replacement part but, alas, I didn’t have one. I figured I was out of commission with the USBtinyISP until realized what the 74AHC125 part was being used for – a level shifter. Since I am currently working in 5V only, I didn’t really need the level shifting feature so I decided to remove until I could order a some replacement 74AHC125’s. I didn’t have this part in a DIP socket so I first clipped the legs at the shoulder and began to de-solder the legs. When everything was cleaned up, I installed a DIP socket and then put jumpers in the slots between pins 2-3, 5-6, 8-9, and 11-12. This would turn out to work for until the replacement part came in fine except that reset would always be low since 2OE is ignored. To workaround this limitation, I would just remove the programmer to continue testing/debugging. Since I had the programmer apart, I decided to upgrade the firmware from 1.04 to 1.06. I also didn’t have a 12MHz crystal/resonator on hand so I improvised again. 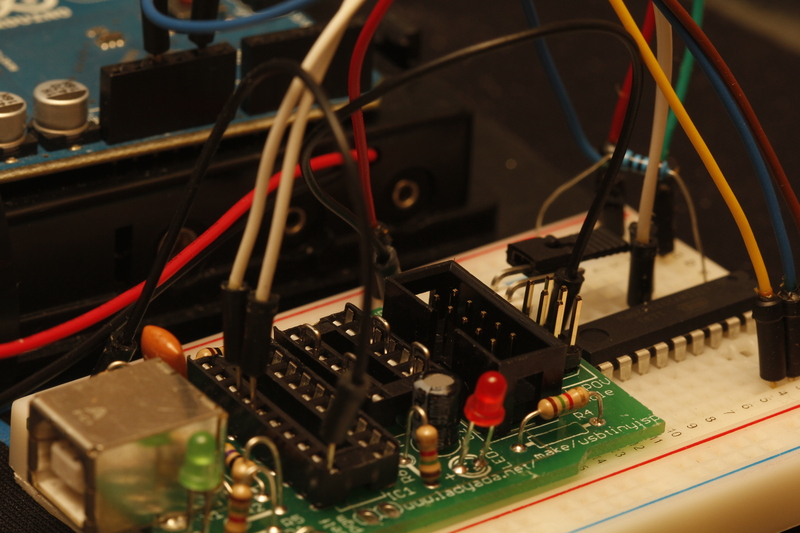 Using the resonator on the USBtinyISP I was able to update the firmware using my Arduino UNO as an avrisp. 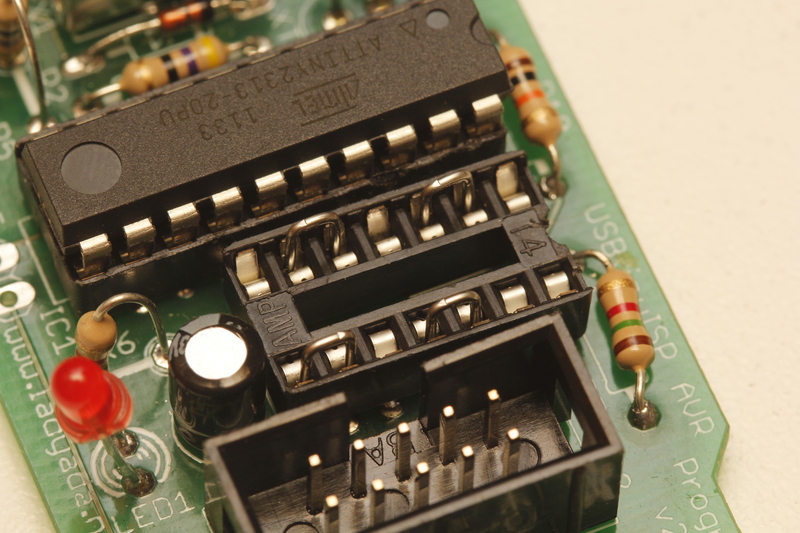 In the image you can see that I added jumper wire from pins 4, 5, and 10 of the ATtiny 2313 in the breadboard to the socket’s pins 4, 5, and 10 (respectively). Using this setup, I was able to upgrade the firmware and now I can use the USBtinyISP in a WinXP guest using VirtualBox and the setup described here.